Ms. Meredith was born and raised on a cattle ranch in Paradise Valley, Montana, and has been practicing law since 2010. She holds a B.S. in Forest and Range Resource Management from the University of Montana, Missoula, and graduated from the University of Montana School of Law, also in Missoula. Ms. Meredith's practice focuses on water rights adjudication and permitting, as well as natural resource, agriculture, and property law. 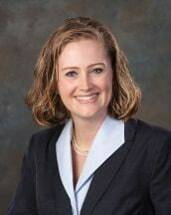 She appears before both state and federal administrative agencies on regulatory matters, is admitted to practice in both Montana state and federal courts, and has previously lobbied Montana state government for local government, agriculture, and private business interests. Prior to her practice, Ms. Meredith worked for the Montana Stockgrowers Association as a natural resources legal intern and completed her clinical requirement with the United States Department of Agriculture's Office of General Counsel. Ms. Meredith is a frequent presenter at continuing legal education courses on the subject of Montana water rights and has authored several publications on the subject. Ms. Meredith draws on her practical experience and passion for natural resource management to assist agricultural and rural communities in navigating legal and regulatory challenges. She continues to work on the family ranch in her spare time and enjoys exploring Montana's outdoors with her husband and two children.